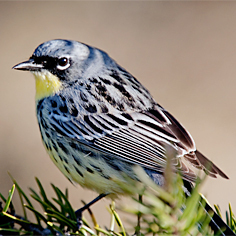 Whether on passage or at nest-sites, warblers will form a big part of the tour and the nearly thirty species may include Blue-winged, Golden-winged, Prothonotary, Kirtland’s, Cape May, Cerulean and Canada Warblers. Other birds we hope to see are Trumpeter Swan, Ruffed and Spruce Grouse, Piping Plover, American Woodcock, Black-billed Cuckoo, Boreal Chickadee, Wood Thrush, Henslow’s Sparrow and Evening Grosbeak. Day 1 Flight from London to Toronto and drive westwards, with comfort stops, to Kingsville, our base for the next six nights. Day 2 After an early breakfast we will make the forty-minute drive to Point Pelee. Our first stop will be at the information centre to find out the latest bird news and, if there is a particularly good bird around, we will look for it. Otherwise we will take the tram towards the point itself and walk the trails. It is unlikely that we will make much progress with our walk, however, as we will be stopping all the time for birds! Warblers may include Blue-winged, Golden-winged, Cerulean, Yellow, Chestnut-sided, Magnolia, Yellow-rumped, Blackburnian, Black-and-white, Black-throated Green, Cape May, Black-throated Blue, Tennessee, Bay-breasted, Wilson’s and Canada Warblers. Other birds could include American Redstart, Northern Parula, Common Yellowthroat, Ovenbird and Northern Waterthrush. Vireos may be represented by Blue-headed, Yellow-throated, Red-eyed, Warbling and Philadelphia Vireos. Additionally, Scarlet Tanagers, Baltimore and Orchard Orioles and Blue Jays will help to brighten the day! When we finally reach the point we can give our necks a welcome rest and look at waders, gulls and terns. Regular birds from the shore here include Bonaparte’s and Ring-billed Gulls, Common, Caspian, Black and Forster’s Terns, Common Loon, Double-crested Cormorant and Spotted, Semipalmated and Least Sandpipers. Returning to the visitor centre via other trails, we will look for less-colourful species that we may have overlooked on our way out. The Empidonax flycatchers, in particular, are a test of identification skills but, with a great deal of perseverance, we should be able to add Yellow-bellied, Alder, Least and Willow Flycatchers to our lists. Blue-grey Gnatcatcher and Ruby-crowned Kinglet high up in the trees will also test our patience. Checking in at the information centre will be a regular feature over the next few days, as only by doing this can we find out about recent discoveries such as a roosting Eastern Screech-owl or an Eastern Whip-poor-will. The centre has an excellent shop, refreshments and rest rooms! Having covered the point area, we will now look at the marshland trails. There should be Pied-billed Grebes around and ducks should include Wood, Ruddy and American Black Ducks and Blue-winged Teal. There may also be the odd lingering Bufflehead, Lesser Scaup, Redhead or Canvasback. Herons frequent these marshes and we should see Great Blue and Green Herons and Black-crowned Night-heron as well as Great Egret. American and Least Bitterns may be less easily found, however! Red-winged Blackbird and Swamp Sparrow are easy to see, but Marsh Wren takes a bit more effort. All the time we must keep one eye on the sky as, apart from the constant procession of Turkey Vultures, Sharp-shinned, Broad-winged and Red-tailed Hawks and American Kestrels will be passing. There are a few open fields, some of which have been set aside for birds, where we may find American Goldfinch, Indigo Bunting and Savannah, Field, White-crowned, White-throated, Lincoln’s and Song Sparrows. At the end of this first eventful day we will have plenty to write up in our checklists back at the motel. Days 3–6 We will visit a number of sites on and around Point Pelee, adding more species to our lists including Killdeer, Greater and Lesser Yellowlegs, Belted Kingfisher, Mourning Dove, Eastern Kingbird, Great Crested Flycatcher, Tree, Cliff and Northern Rough-winged Swallows, Chimney Swift, American Crow, Black-capped Chickadee, Grey Catbird, Brown Thrasher, American Robin, Cedar Waxwing, Eastern Bluebird, Rose-breasted Grosbeak, Northern Cardinal and Eastern Towhee. One evening we will visit a site for displaying American Woodcock. As the days progress we will be more relaxed as we become familiar with the birds. We will also go to other sites, such as Hillman’s Marsh, for Short-billed Dowitcher, Wilson’s Phalarope and Baird’s, Pectoral and White-rumped Sandpipers, and St Claire Wildlife Reserve, which has breeding Yellow-headed Blackbirds as well as both bitterns. Day 7 Leaving Kingsville, we will drive west across the international border into Michigan, USA, then north. It is about an eight-hour drive to our destination but we will make several rest stops en route. Crossing the bridge into the Upper Peninsula we will be staying for three nights in Paradise, a small town close to Whitefish Point on the south shore of Lake Superior. We are likely to see a number of new species here and the surrounding boreal habitat will give us a good opportunity to find Spruce and Ruffed Grouse, Black-backed and Pileated Woodpeckers, Northern Flicker, Canada Jay, Olive-sided Flycatcher, Boreal Chickadee, White-breasted and Red-breasted Nuthatches, Golden-crowned Kinglet, Pine Warbler, Purple Finch, Evening Grosbeak and Rusty Blackbird. Day 8 All day will be spent around the Whitefish Point area looking for migrants and the specialities. The Lake Superior shoreline has nesting Piping Plovers and we will also spend some time there ‘lake watching’ for White-winged Scoter and Long-tailed Duck, which pass north at this season in some numbers. In the evening, if we are willing to stay up late, we can return to the point as there is a possibility that we may encounter one of the owls being banded there if it is a good year. The most likely would be Northern Saw-whet, Boreal, Barred, Great Horned or Great Grey Owl. Day 9 Today’s destination, the huge Seney National Wildlife Reserve, supports a number of species not easily seen elsewhere on the tour: Ring-necked Duck, Hooded Merganser, Sandhill Crane, Sharp-tailed Grouse, Sedge Wren, Clay-coloured, Le Conte’s and Vesper Sparrows, Brewer’s Blackbird and the reintroduced Trumpeter Swan. If we are very lucky we might spot a Yellow Rail here. Day 10 After checking Whitefish Point again we will return south, visiting a site en route, which is good for Canada Jay. In the late afternoon we will arrive in Grayling in the heart of the Lower Peninsula for a one-night stay. Day 11 An early start will be required for the Kirtland’s Warbler tour. This critically-endangered bird is easy to see given placid weather. If we succeed with time to spare we may drive east to the Tawas area for Grasshopper and Henslow’s Sparrows and migrants on the point. Mid-afternoon we will return south to Detroit and then head east back into Ontario for a three-night stay in Kingsville, close to Point Pelee. Days 12–13 The last two days will be spent further exploring the Point Pelee area for new migrants including Ruby-throated Hummingbird, Black-billed and Yellow-billed Cuckoos, Swainson’s, Wood and Grey-cheeked Thrushes and Veery. We may also see one of the late-arriving, more difficult warblers: Connecticut or Mourning Warbler. We will also visit Rondeau Provincial Park, which has several breeding species that are difficult to see at Point Pelee including Prothonotary Warbler and Red-bellied and Red-headed Woodpeckers. Day 14 This morning we will journey to Long Point where we will look for specialist breeding species including Prairie Warbler, Louisiana Waterthrush and Grasshopper Sparrow. Overnight at Long Point. Day 15 After early morning birding around Long Point, we will return to Toronto via Niagara Falls for a short tourist stop. Overnight return flight to London, arriving on Day 16. General Information The pace of the tour is generally moderate with a comfortable amount of walking over easy terrain. Long days may be spent in the field, however. The weather can vary enormously from hot to cold and wet. Insects may be just becoming a nuisance in one or two places at the end of the tour. There are no special health requirements. Visas are required. Accommodation is in medium-quality motels with ensuite facilities. Food is excluded from the tour price but is relatively inexpensive; allow about £20 per day depending on your requirements. Group size Minimum number for tour to go ahead: 8; maximum group size: 10 with 1 leader, 16 with 2 leaders. Price includes economy flights between London and Toronto, all transport within Canada and the USA, accommodation in twin-bedded rooms, entrance fees to National and State Parks and guiding services throughout. Excluded are food and drink, insurance, visa, gratuities and items of a purely personal nature.